Music will always be a part of our family. My father used to play the drums during his younger years when he was still a member of a band. My mother sings; she even joined a singing contest on TV once and emerged as one of the winners. I was a member of our college choir; singing is one of my passions, too. I used to sing to Justin while he was still inside my tummy and even after I gave birth to him. I would sing lullabies to put him to sleep. It didn’t come as a surprise, therefore, that my son is also musically inclined. 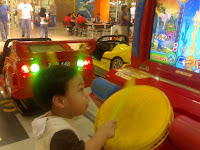 He loves to sing, dance, and play toy musical instruments. Too bad, I wasn’t able to take pictures of him doing all of these things. I only have these two photos to share. This entry was posted in Mommy Moments, Music. Bookmark the permalink. wow ang galing ni justin! added you here tech…good day mommy!